The following article was written by Ian, our resident 7-series afficionado………. ………….”This is an amazing car. I’d hoped the admiring glances I received when driving were for me, but alas, no they were indeed for the car, and rightly so. The E38 has considerable road presence, even today, some six and half years after production ended. This particular car was owned by BMW for the first six months. 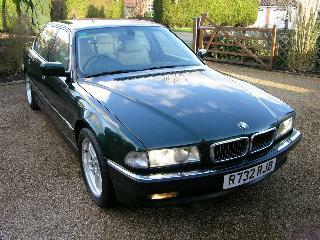 During its time with them the car bore the registration number 750IL. A perfect complement for such a fine vehicle. This is an ‘Individual’ model which makes it not only very rare but also just a little more special. 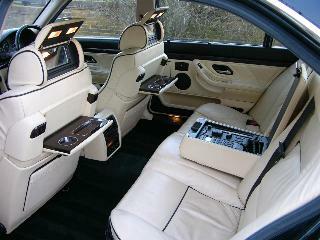 The car is finished in metallic Oxford Green and inside the champagne leather is complemented by English Green piping. 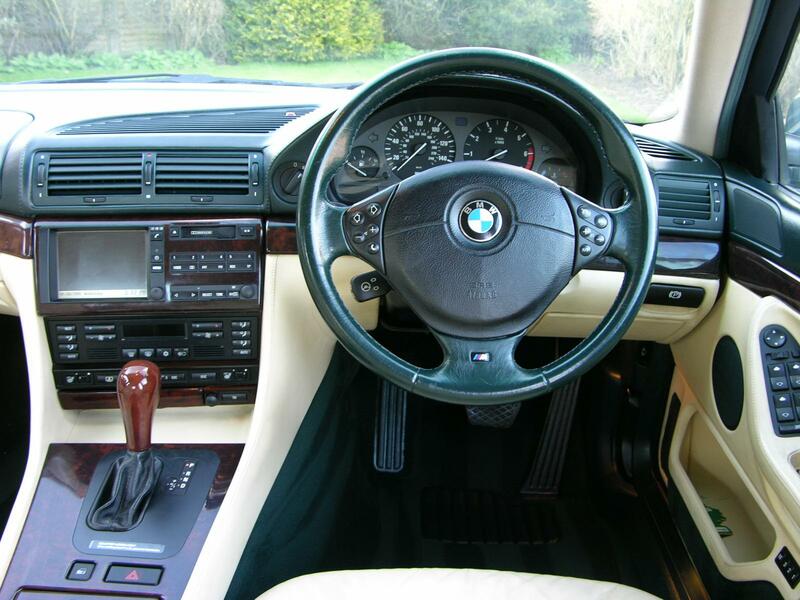 The English green leather extends to the dash and the tops of the door cards. The green carpets are protected by matching deep pile overeats with champagne leather edging. The driver can expect every possible luxury. After the comfort seat has been appropriately set using the electronic adjustments the setting can be stored using one of three memory functions. Settings for the steering wheel position and mirrors can also be stored and recalled from the key when the car is unlocked. Set the destination in the professional sat-nav and the system will guide you to your destination and If you arrive early you can pass the time by watching the on board colour TV or perhaps checking your shares on teletext. Rear passengers are truly pampered with an extra six inches of legroom compared to the standard version. The double-glazed windows keep external noise down to a minimum. There is a fridge to keep your champagne cold on those long journeys and fold down picnic tables to keep your crystal glass safe. Heated seats to keep you warm and your own air conditioning to keep you cool. If you need to remain anonymous, the rear blind can be closed with a touch of a button. I’m afraid that the side blinds will have to be closed manually.If it’s music you want then rear passengers have full control over the audio functionality via the console situated in the armrest. The 5.4 litre V12 engine produces 326 bhp and was the winner of the 1999 International Engine Of The Year award in the above four-litre category. The same engine has also been used by Rolls Royce, praise indeed! It is quite possible to achieve 26 mpg plus on the motorway. In fact, I have had closer to 30! There speaks a man who indeed knows his stuff! In the instance that I was ever likely to decide to buy a BMW, I would hang around for the mid life renew due to the fact they usually do it with just about every design for what? past 20 years now? Even the e90 had a mid life up-date.